As a notary public, you will be asked to notarize a variety of documents. It is important to be prepared and informed with up-to-date state board appointed specifications. Notarial information or verbiage may not be supplied by your client on the document. Many notaries dislike writing out the lengthy required verbiage and that is why we created the MaxLight X Notary Jurat stamp. 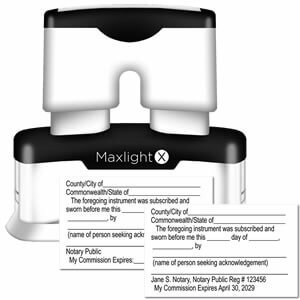 The MaxLight X Notary Jurat stamp provides ample room to input required information. When performing a jurat transaction, the notary must attest that the signer has been properly identified and has taken oath and acknowledged every thing outlined in the document. The MaxLight X Notary Jurat stamp will not only give you confidence as a notary but will also impress your clients. Unsure if this is the correct notary tool for you? Contact us! Our MaxLight X Notary Jurat stamp is a premium pre-inked stamp made by an environmentally-friendly flashing process that significantly reduces waste and emissions compared to other traditional manufacturing processes. The MaxLight X Notary Jurat stamp's large built-in inkwell never requires replacement ink pads and will last up to 50,000 impressions without the need to re-ink. Our talented team diligently creates your stamps according to your personal needs.